FireFox is rapidly gaining popularity among web surfers. One of the plethora of very nice features is the "live bookmark" feature that allows you with one simple click (well okay a couple) to subscribe to a news feed in RSS or Atom format and follow it by means of bookmarks. In this article I will explain how the subscribe feature works and tell you how to make your site appear to FireFox surfers as a live bookmark site so that they can easily add your feed. 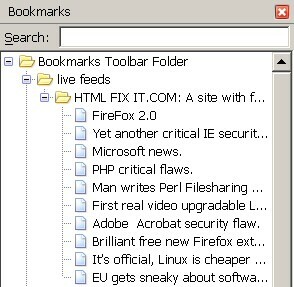 Live Bookmarks is a new technology in Firefox that lets you view RSS news and blog headlines in the bookmarks toolbar or bookmarks menu. With one glance, quickly see the latest headlines from your favorite sites. Go directly to the articles that interest you--saving you time. A site is enabled for Live Bookmarks when you see this icon ( ) on the bottom right corner of the browser. Clicking on the icon and selecting an RSS feed will bring up the Add Bookmark dialog. Select 'OK' and you will see Live Bookmarks with the rest of your bookmarks. Many people find it especially convenient to save Live Bookmarks in their Bookmarks Toolbar folder. Please note that if you use a different theme in the browser, they may have adjusted the look of this button. You can see it in the bottom right of this screenshot. If you take the time to click on the button, you get a submit type of menu button like the one just below. Clicking on that will bring up a familiar "Add Bookmark" dialog box like that pictured below as well. In my case I have already made a folder in bookmarks called "live feeds". You can name your folder anything you want, but I would encourage you to make a separate folder from where you store your other bookmarks. Bookmarks -> Choose The Folder -> Choose Any Subfolder -> Click on Any Interesting Headline. This method is demonstrated in the following figure. View -> Sidebar -> Bookmarks (or Control + B). The result is placement of your current headlines in a nice panel to the left of your browser window. If you would like your visitors to see the little icon and be able to subscribe to your pages, you of course need live content. Specifically you need an RSS or Atom feed. I presume you already have that, but if not, use the contact form and we will do a tute on that subject next :-) Assuming, of course, that you have an RSS feed, then it is simply a matter of including the proper mime-type tag with a link to your feeds in the head of your page. Amazingly, some big sites with RSS feeds, as of the date I write this, have decided not to -- or don't understand how to -- make themselves live bookmark friendly! So get off the sidelines and help your readers keep up with you by adding live bookmark capabilities to your website today.